"The most powerful staff. Sometimes deals critical blows." Chest at the Giant Crevasse. 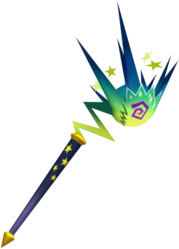 The Meteor Strike is a staff that can be wielded by Donald Duck in Kingdom Hearts Final Mix. The Meteor Strike's handle is a dark shade of blue with a yellow, conical pommel and several yellow stars decorating its upper half. The head of the staff is connected to the handle by a zig-zagging shaft, while the head itself has a number of long spikes and several yellow stars on its back, creating the appearance of a meteor heating up upon entering the atmosphere. The staff's head also has two periwinkle-colored, spiral-shaped "eyes" and a jagged "mouth", not unlike that of a Heartless. The whole head is a mixture of blue, green, and yellow in color. This page was last edited on 5 April 2019, at 13:18.